http://www.engvid.com/ If someone asks you your opinion, don't say "so-so", or maybe. Tell the person how you feel. 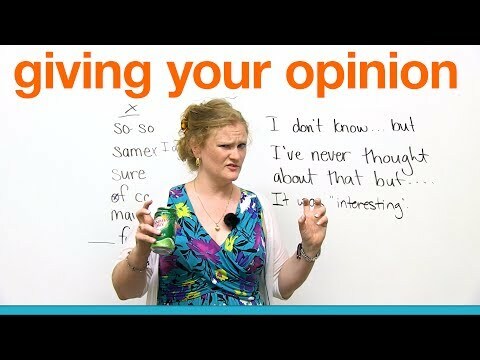 In this lesson, learn how to give your opinion! Don't be shy! http://www.engvid.com/conversation-skills-giving-your-opinion/ TRANSCRIPT Hello. Welcome to the lesson of giving your opinion. My name is Ronnie. Do me a favor. Go to YouTube. Go to my page, EnglishLessons4U, and subscribe to my channel. Watch out for imitators. I'm the real deal. Be careful. I'm going to teach you guys how to give your opinion. Now, you might think, "Ronnie, I already know how to give my opinion." If someone says, "Hey, do you like pizza?" And I say, "It's so-so." Your opinion is "so-so"? Guess what, that's a really bad answer. So I want to teach you some techniques to continue a conversation when you have to give your opinion. This happens all the time. Maybe you went to a new restaurant or you saw a movie or you went to a new pub or bar or restaurant and you want to tell people, "Oh, my god, it was great! I went to the new restaurant that opened up." And your friend says, "How was it?" And you say, "Okay." What kind of answer is "okay"? Was it good? Was it bad? Did you get diarrhea? Did you like it? What did you eat? So when someone asks you your opinion, instead of giving short, one-word answers -- "Yes." "I liked it." "It was great." -- you need to expand, and you need to give more information. Here is a list of things that you should not say when someone asks your opinion. -"So? How was the movie?" -"So-so." What the hell does "so-so" mean? "So" means "yes" and "no" at the same time? If someone said to me, "It's so-so", I think it's bad. Don't say that. Maybe your friend and you saw the same movie, and someone asks your friend, "Hey, how was the movie?" Your friend said, "Well, it was a little boring, and there wasn't a lot of action. I didn't really like it that much." The conversation naturally would go to you, and you'd go, "Same." Same what? Please don't do this. It's so frustrating when you're trying to have a conversation with someone. Don't say "same". You are an individual. Please give the person your opinion. You can say something like, "Well, I agree. It was boring, but..." -- add your own spice of life; add your own opinion. So instead of saying "same", you can say, "I agree", and then add your information. The next one. Now, if you're a little shy, and someone offers you something, for example, "Would you like to have free English lessons?" "Sure" is a good answer. But if you're giving your opinion, for example, "Did you like the new restaurant that you went to last night?" "Sure." "Sure" is a really, really bad answer. What, again, you want to do is expand in your answer. This is the worst thing you can say if someone asks you your opinion or if they ask you a question about something. As an example, someone might say, -"Ronnie, are you from Canada?" -"Of course." "Well, excuse me for asking." You only are going to use "of course" if someone has asked you a very, very stupid question or a question that they already know the answer to. As an example, you could say, "Ronnie, you're from Canada. Do you have red hair?" And I'd say, "Of course I do. You can see it." So when you answer "of course", it does not mean the same as "yes". "Of course" is a very, very rude way to answer someone's question if they ask you something. So please be very careful of this. "Are you enjoying your English lessons?" "Of course!" Good answer. "Maybe." "Do you like Ronnie, teacher?" "Maybe." Maybe? What does "maybe" mean? So "maybe", "sure ", "same", "so-so" -- garbage. Don't use them. "Maybe" -- are you not going to tell me the answer? Is it a secret? Don't say "maybe". Another one that a lot of you guys say is unnecessary unless you want to exaggerate something. So let's say, again, that you went to a new pizza shop, and you ordered some really spicy pasta -- at a pizza store. That's okay. So you get the pizza or the pasta; it's really spicy, and you eat it, and your friend goes, "Hey how's your spicy pasta?" You're going to say, "It's spicy." You do not need to say, "It's spicy for me" because you are the one talking. So you can just say, "It's spicy." Now, the way that we would use this correctly is to exaggerate something. Example: If you're having pasta that's really, really spicy, and your friend is having the same pasta dish, maybe your friend is eating it and goes, "This is not spicy for me." You're exaggerating that one is spicy and one isn't. So you're eating it; you're dying; you're crying; your face is turning red; you say, "God, this is spicy." Your friend's, like, "This isn't spicy for me." So you're exaggerating your point. Be careful about this one. So these ones: Don't use them. This one: Only if you're exaggerating a point. These -- are the good ones. These are the good guys. These ones don't exist anymore. 자료 덕분에 수업 시간에 굉장히 잘 활용하고 있습니다.